A tribute to salted caramel, this set makes for the perfect gift. Our indulgent Florentines and sweet, crumbly shortbread fingers are both handmade exclusively for The Wolseley. Our Florentines combine nuts, sultanas, citrus, stem ginger and irresistible salted caramel, topped with a luxurious milk chocolate. 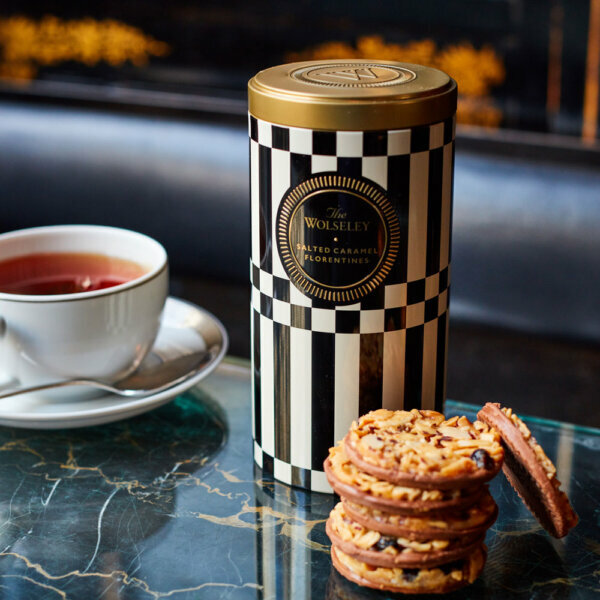 Our ever-popular Shortbread – handmade to The Wolseley’s own recipe – has been elevated here with the addition of moreish salted caramel chips. Presented in smart re-usable tins inspired by The Wolseley interiors. INGREDIENTS: Caramel Chocolate (Sugar, Cocoa Butter, Whole Milk Powder, Cocoa Mass, Skimmed Milk Powder, Caramelised Sugar, Emulsifier: Soya Lecithin, Flavouring, Spice, Natural Vanilla Flavouring) (35%), Flaked Almonds(17%), Golden Caster Sugar, Salted Butter (Milk), Cream (Milk), Flaked Hazelnuts (4%), Sultanas, Mixed Peel (Orange Peel, Glucose Fructose Syrup, Lemon Peel, Acidity Regulator: Citric Acid, Preservative[Sulphites]), Stem Ginger (Ginger, Sugar, Water), Rice Flour, Invert Sugar Syrup. (White Sugar, Cane Sugar, Water), Glucose Syrup (Sulphites), Salt (0.7%). ALLERGY ADVICE: For Allergens, see ingredients in bold. May contain traces of Milk, Nuts, Egg, and Gluten. INGREDIENTS: Wheat Flour, Butter (Milk) (34%), Sugar, Caramel (Glucose Syrup, Sugar, Condensed Milk, Butter, Salt) (4%), Salt (1%).